An original letter of correspondence between Joshua Coffin Chase and his nephew, Franklin W. Chase. 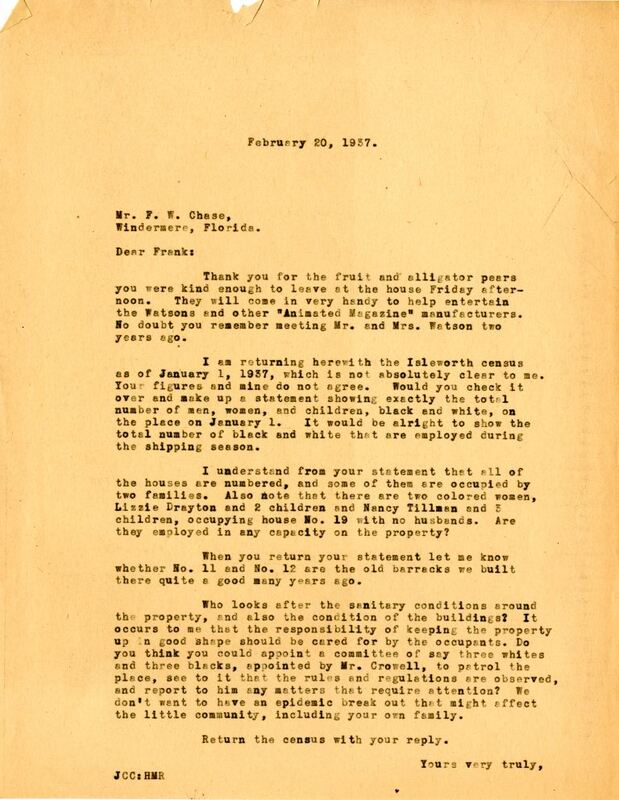 Topics discussed in the letter include Joshua's gratitude for the fruit and alligator pears Franklin gave him, the discrepancies in the Isleworth census, and the supervision of sanitation on the property. Original letter from Joshua Coffin Chase to Franklin W. Chase, February 20, 1937: box 49, folder 20.84, Chase Collection (MS 14), Special and Area Studies Collections, George A. Smathers Libraries, University of Florida, Gainesville, Florida. Digital reproduction of original letter from Joshua Coffin Chase to Franklin W. Chase, February 20, 1937. Thank you for the fruit and alligator pears you were kind enough to leave at the house Friday afternoon. They will come in very handy to help entertain the Watsons and other "Animated Magazine" manufacturers. No doubt you remember meeting Mr. and Mrs. Watson two years ago. I am returning herewith the Isleworth census as of January 1, 1937, which is not absolutely clear to me. Your figures and mine do not agree. Would you check it over and make up a statement showing exactly the total number of men, women, and children, black and white, on the place on January 1. It would be alright to show the total number of black and white that are employed during the shipping season. I understand from your statement that all of the houses are numbered, and some of them are occupied by two families. Also note that there are two colored women, Lizzie Drayton and 2 children and Nancy Tillman and 3 children, occupying house No. 19 with no husbands. Are they employed in any capacity on the property? When you return your statement let me know whether No. 11 and No. 12 are the old barracks we built there quite a good many years ago. Who loks after the sanitary conditions around the property, and also the condition of the buildings? It occurs to me that the responsibility of keeping the property up in good shape should be cared for by the occupants. Do you think you could appoint a committee of say three whites and three blacks, appointed by Mr. Crowell, to patrol the place, see to it that the rules and regulations are observed, and report to him any matters that require attention? We don't want to have an epidemic break out that might affect the little community, including your own family. Return the census with your reply. Chase, Joshua Coffin. 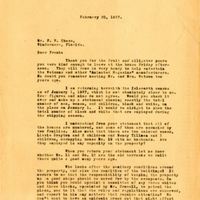 “Letter from Joshua Coffin Chase to Franklin W. Chase (February 20, 1937).” RICHES of Central Florida accessed April 21, 2019, https://richesmi.cah.ucf.edu/omeka/items/show/2761.